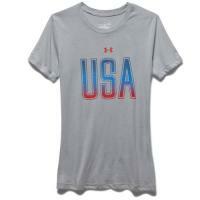 This women's short sleeve crew neck t-shirt from Under Armour is a great way to show your pride in the United States. It comes from the UA Freedom line, through which Under Armour donates a minimum of $250,000 each year to support law enforcement and military personnel, first responders and veterans. It is made from Charged Cotton, a high-tech cotton/polyester blend that feels soft, dries quickly, and stretches to enhance mobility. The Moisture Transport System wicks sweat away from your skin, ideal for active wear, while the inbuilt anti-odor technology keeps it smelling fresh and clean for longer.